I regularly browse through the second hand or unsold food magazines at mall stores like “Book Sale” and other shady re-retailers of books and magazines. Sometimes the stuff looks like it might have come out of someone’s garbage, other times they are unsold issues of magazines that somehow make it to the Philippines. At any rate, when the prices of the magazines are PHP100 or below, I stock up, and I don’t mind reading issues that may be as much as a year old… food will still be food. So when I found a nice looking issue of Waitrose FOOD Illustrated (February 2009 issue) the other day, with a fantastic feature section on pork, I snapped it up. 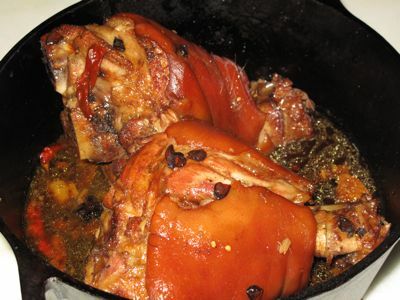 And within 48 hours tried one of the recipes entitled “Sweet Soy Pork Hocks” or something rather similar to pata tim served in local Chinese restaurants. It is an INCREDIBLY SIMPLE recipe, and while it can take up to five hours, the results were superb for the effort expended. An instant household favorite. I purchased two large “patas” or hocks and saved the hooves for another use. The two meaty parts of pork fit nicely into a un-enameled dutch oven that I had, made by Lodge, the cast iron folks. To this I added about a cup of rice wine, a cup of chicken or pork stock, 1/2 cup of kikkoman soy sauce (though a dark soy would work too, maybe just add a little less of it), 4 tablespoons of muscovado sugar, about 8 1/2 inch thick slices of fresh ginger, 5 cloves of garlic smashed slightly, 5 star anise, and several whole dried red Chinese chillies. I covered the pot and stuck put it in the oven with the shelf set in the middle. I then turned on the oven to 300F and went off to take a nap. About 1.5 hours later, I flipped the patas over, put it back in the oven, then went off to answer reader emails and comments and write a new post. About another hour later, I went back to check it and it seemed to be cooked but not yet soft enough. So I left it in the oven for another 45 minutes or so, for a total braising time of roughly 3 hours and 15 minutes. Next, I removed the cover of the pot and stuck it back in the oven and checked it every 20-30 minutes to make sure it wasn’t getting caramelized too fast and that the liquid was drying up. Turn the patas over once and keep braising with the liquid. When total cooking time hit 4 hours and 45 minutes, it looked brilliant to me, so I removed it from the oven. Looks delicious! Can i cook it in the stove instead of oven? will the result be the same? Yeah I am curious if this can be cooked on the stove-top. I might go with a slow-cooker version. I pulled off something akin to the pata tim, and therefore resembling this dish, a few weeks ago. I found some delightful pork hocks that had a lot of the tendons and the thick fatty skin – quite uncommon in German supermarkets. I did it completely on stove top for about five hours in total. The meat just surrendered with a quiver in the end to my spoon. Next time I will try it on the oven using your recipe! Thanks. How about a pressure cooker to speed things up? I have compared pressure cooker vs stove-top braised and I say that if you have the time, go for the braise and if not, the pressure cooker will do just as well. But the infusion of flavor is somehow not as pronounced in the latter. I could just be fussing, of course, hehe. 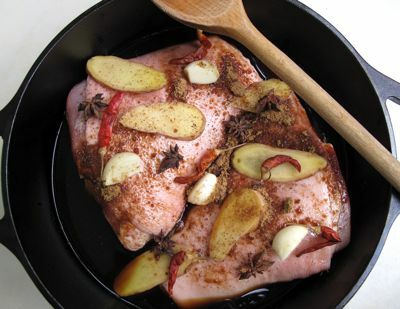 I was thinking this would be perfect in the slow cooker then just finish off in the oven. 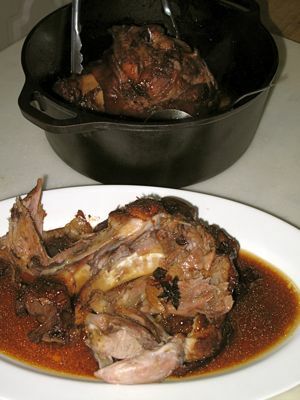 your braised pata would have been iron-enriched by that time because of the rice wine leeching iron into the food. been compiling recipes to try for the holidays and this would make a great addition to my list, thanks! Try the same recipe with chicken legs but omit or half the stock and less musovado. I like to add scallions and combine Kikkoman with Coconut brand soy sauce, easy on the amount. I prefer braising stove top. Serve with cucumber slices in vinaigrette dressing or 3 bean salad. Just as delish, unless the fatty skin is your thing. This is one of the dishes that is even better when eaten the next day. so happy and finally got a chance to comment on your blog MM. i always read your entries and found myself having a “tulo laway” moment whenever i see the delicioso pictures of foods on this blog. God Bless and you may have more years of food blogging!!! i wonder if duck will work for this recipe…maybe without the rice wine? MM, I tried that before using my “banga” niluto ko sa kalan na uling (low-technology) lol. Now were cooking, pata in any form is my favorite. I have always cooked this dish on the stove top in an enamelled cast iron pot. It works with a pressure cooker too, but tastes different. I add some dried tangerine peel as well, and omit the chillies, using crushed whole pepper corns instead. If you get the opportunity instead of muscovado try using rock sugar. Good chinese groceries stock this kind of sugar. MM, is this similar to what we call “humba” in Cebu? Must try this recipe but it will end up just myself eating the whole lot. There is actually a very primitive technique on how to speed-up the cooking process of these type of meat with out damaging its tenderness…I used to put a lot of SPOON or FORK (metal) together with the meat while still in boiling process..The heat from metal utensils will adhere to the already hot steamy water while boiling, then simply remove them when the skin starts to turn tender.. Try that technique and you will be surpriced. it will cut your cooking time to up to half of the regular time, means, even you save a lot of cooking gas in process, specially that gas is i guess expensive in the philippines this days..
We cook a similar dish from time to time, I’m just not sure what the right name would be: humba or paksiw na pata? I will cook it next time with an extended braising time. We usually finish it after an hour. Hi MM! I use rock sugar instead of muscovado in my pata tim or adobo. Probably it will likewise work well with this braised pata. A clay pot under low fire will do wonders too! This sounds good! I’ll try it soon! I prefer slow braising in the oven than on top of the stove. This is good winter food – where you need the “fat” to keep you warm. A good thing to serve w this is Chinese snow cabbage or red in snow. Except it could be too salty, so I just rinse in cool running water & drain before using. I do a related dish “hong ma” or maybe more familiar to you as “humba” w an easy lazy recipe from a Chinese co-worker. 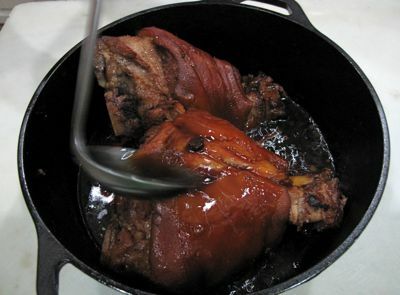 In a heavy pot, place 3-4 pcs of fresh pork hocks (about 2-3 lbs). Pour on top 1 can of black bean sauce (or ~ 4 Tbsp black or brown bean bottled paste/sauce), 1 can of Chinese pickled cucumbers & then enough water to cover meat. Bring to a boil & then lower heat to a slow simmer. Cover & cook for as long as needed till hocks are tender. Add quail eggs or hard-boiled small regular eggs w shell on but crack shells. You may even add dried Chinese chestnuts but my guys don’t like that because it makes the sauce sweet. Easy cooking, just need to check every now & then & stir to prevent meat from sticking at bottom. If it ends up too greasy – you can cool & remove/defat the congealed fat on top & the reheat. Reheating is best done without the eggs. I’m bookmarking the main webpage. Thanks for the reference MM! MM Did you use 5 whole pieces of star anise? I would think…just 5 of the smaller ‘parts’ of a star. I would not use more than 1 to 1 1/2 of the whole star anise in a pot of braised meat. Old folks used to say that too much star anise will cause falling hair. Folk tale?? In any case, if you can get the rock sugar, try it. Your meat braises will be different, I think much better. Thanks for this great post. I will try to make it this weekend. Like your other post like the chicken inasal. I tried it this week. My youngest kid loved it. Yes, San, I kind of agree. 5 whole star anise maybe cloyingly aromatic, I would think, if it does not cause your hair to fall off, but maybe MM’s star anise are smaller compared to the ones we get here in the US. At the most, I use 1 pc of small star anise. But then I thought the same thing about using 10-12 pcs of bay leaves for adobo until I tried it and it was okay. I still wonder though whether after you reach a certain saturation point , adding a few more really don’t make a difference in which case, you may just be wasting your ingredient. Vicky Go	, will have to try your humba recipe. I remember my mom’s version of it, cooked specially during the holiday season, and aged in the fridge, but she adds some vinegar, fermented soy bean cake ( tahure?) and sugar I think , and would simmer slowly in a clay pot. We would have simpler comfort dishes and less of meat the week before so our holiday eating will taste even more special. Mom always said a little hunger ( in this case some meat deprivation) is the best appetizer. MM, what do you think of slow cookers? I cooked something similar in our slowcooker with good results. With rising LPG prices, it seems cooking with a slowcooker is more economical. Connie C: I like this “humba” recipe because there’s no measuring involved & yet it comes out OK all the time. I’ve even used different brands of pickled cucumbers & it still works. My MIL said to use “yellow Bean Sauce” as the beans are softer, but that is hard to find. Mostly I use Brown Bean Sauce – a compromise, somewhere between Black & Yellow. I don’t use the black beans in the can – so I just eyeball the amount & 4-5 heaping tablespoons per pot seems to be good. I like this idea of open & dump – it makes things easier! BTW, you add everything in the pickled cucumber can – so there’s sweet & sour notes there already. If you use spicy garlic bean sauce – then you add spice heat w the salty note. Don’t know if this is a stupid question but I’ll ask it just the same. Just wondering why you didn’t use an enameled dutch oven for this recipe. Again, yum, yum, yum … Will definitely try this soon. Hello MM. Just wanted to say that by a process of trial and error we replicated this but on the stove top! We could not find nice fresh looking pata in the stores so instead bought about a 1.5kg piece of pork belly. Marinated it first in the sauce and then dropped into the oven. 15 minutes later the oven thermometer failed and started pumping at full blast! So, thinking hats on, we cut the piece of meat in half and transferred to a large casserole dish and placed on the oven top for a slow cook of about 3.5 – 4.0 hours. There was more than enough liquid to keep it cooking throughout. Finished it with a quick 15 mins in the crazy oven (now pumping out at the equivalent of gas mark 10). Sorry long story but in summary YES it does work on the stove top AND it was absolutely delicious. As you wrote this was an immediate favourite. The meat is incredibly tender and very rich. Thanks for posting the recipe.